It is holiday time, and everyone is getting ready to cook up a feast. This includes everyone’s favorite dishes, from stuffing to pumpkin pie. Friends and families are gathering together and sharing in the love that speaks so loudly this time of year. There are many things rushing through our minds during this time of year, but one of the things that most people forget to consider is food safety. This is actually a very important issue, when you consider how much cooking is going on, and you want to make sure that you take care in the preparation of your food in order to ensure that no one gets sick. While the United States’ food supply is one of the safest in the entire world, there are still some 76 million people each year that get sick from food borne illnesses. Food safety can be especially challenging during the holidays, as not only is it already cold and flu season and so many people are already sick to begin with, but also because the menu includes many more dishes than normal. One of the best things you can do during the holiday season is to have a master plan set out for yourself. After all, the top chefs do it, and so should you. You will want to have the proper heating and cooling devices ready, as although a single oven and refrigerator or freezer is enough for most people, those who are cooking larger amounts of food may require more, and you want to be prepared for this rather than realizing it when it is too late. You need to have plenty of clean ice and always keep foods properly heated or cooled, depending on what is called for. It is important when cooking that you wash your hands frequently, especially around the holidays when there are so many colds and flu going around. Washing your hands is one of the easiest ways to minimize bacterial contamination and keep your food safe. You especially need to make sure you clean your hands thoroughly after handling the turkey or any other raw meat. 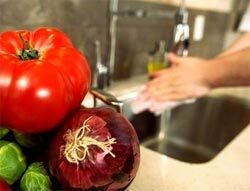 Besides washing your hands, you should wash all fresh produce as well. Even greens that are prepackaged should be washed before cooking in order to minimize potential bacterial contamination, and simply rinsing it under cool water will be enough. Defrosting your food completely before cooking it is very important when it comes to food safety issues. If you choose to use a frozen turkey then you are going to want to allocate 24 hours per 5 pounds to defrost in the refrigerator and then you can leave the bird on the counter to defrost the rest of the way, if necessary. Also, in consideration of drought conditions in certain areas of the country, defrosting the turkey using water may seem wasteful but it is one of the safest methods, especially if you need it defrosted in less time. This is quite obvious, but it is alarming how many people assume they have cooked food to the right temperature when it really is not. This is why it is ideal to use a thermometer when cooking, especially when it comes to meat which is very bacteria prone. It is necessary to cook meat to a specific temperature in order to ensure that any potential bacteria are destroyed. Another incredibly important rule that should be followed, it is important to remember that leaving food out too long is one of the biggest holiday food safety problems. It is fine to leave food out right after eating to give you time to relax, but when food sits out for more than two hours in the danger zone, which refers to any temperature ranging between 40 and 140ºF, then it is prime for bacterial growth. You should store any leftovers in 2-inch deep, shallow containers and make sure that the refrigerator is never too full so that there will be plenty of air circulating throughout it. One food safety tip that most people would not realize involves apple cider. It is best to serve only pasteurized apple cider because this means that the juice has been pasteurized in order to destroy any harmful bacteria. While you can buy unpasteurized juice you will have to remember that it will contain a warning that it can cause serious illness in vulnerable people. It is important to be careful when cooking meat, but also with eggs. Many eggnog recipes call for uncooked eggs but keep in mind that in these cases you should be using pasteurized eggs or at least cook the yolks lightly to make sure you kill any potential salmonella bacteria. Eggs should be kept refrigerated until used and if you spill any on the counter or floor it should be cleaned up immediately. Of course this is the holiday season and you want to be around those that you love, but you should really keep guests out of the kitchen while you are preparing the food. As few people as possible should be around food while it is being prepared in order to prevent anyone from picking at the food and reduce the risk of contamination, especially during this time of year which is cold and flu season. It is important that when you go to reheat any leftovers you heat them to a proper temperature. Filling a plate of leftover food and popping it in the microwave may seem safe enough, but there is actually cause for concern here. You still really should use a thermometer in order to make sure that all the food has been reheated to a suitable temperature, to avoid sickness as best you can.